Continuing her high-performance communication series, technology industry veteran Kristin Zimmerman narrows her focus to IT project proposals and strategies to show ROI on software purchases. Often, IT insiders see the value in innovative products and services from vendors, but these experts struggle to get the go-ahead from purchasing, finance, or C-level decision makers. As an executive at a software development firm, she encounters clients struggling with this very issue. 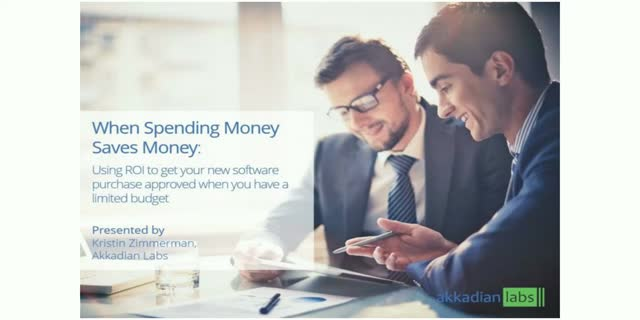 In this presentation, she shares effective practices for getting a much needed project approved when companies are operating with budget constraints. Kristin Zimmerman is the EVP of Global Sales at Akkadian Labs and has held previous leadership positions at Cisco, Avaya, and Xerox. Over her tenure, she has embraced a simple architecture for high impact communication and presentations. When a company deploys new technology, success depends on effective user education and adoption. This means employees not only need to understand how the technology works, but they need to change their behaviors. This doesn’t happen through osmosis. From the earliest stages of planning new technology deployments, companies need to think about lines of business workflow. How do people currently work and what role will the new technology play in this work? In this webinar, you will learn fundamentals of building an adoption plan, including identifying use cases, internal marketing and collecting feedback to evaluate success. Amy Thacker is a marketing veteran with a graduate degree in teaching. Her experience allows her to meld internal marketing strategies with training best practices. akkadian Provisioning Manager Express (aPME) designed for Cisco's Unified Communications Manager (Cisco Call Manager) provisions the following in 40 seconds: end user, extension, voicemail, device profile, Jabber desktop, Jabber mobile and SNR. Have you ever struggled to get your key message or communication understood? Do you find that your ideas and proposals are often stalled or not acted upon? Do you find yourself struggling to reduce content for a key presentation? If the answer to any of these is YES, then perhaps this webinar is for you. Kristin Zimmerman is the EVP of Global Sales at Akkadian Labs and has held previous leadership positions at Cisco, Avaya, and Xerox. Over her tenure, she has embraced a simple architecture for high impact communication and presentations. Inspired by the book, “As We Speak” Kristin has developed her own architecture and has coached others to do the same. Cisco provides APIs and SDKs which allow users to integrate their existing or new products on top of Cisco's UC platforms. Most customers don't realize these features are available to them out-of-the-box with their Cisco products. Join us for a discussion and demonstration of how some of these APIs and SDKs, including the Jabber SDK, AXL API and other UC specific integrations that Cisco packages with their popular UC products. In 2014, Hogan-De Paul joined the ranks at NYC-based Akkadian Labs as an experienced software engineer, specializing in custom Cisco Collaboration software with the company. His day to day role consists of gathering customer requirements, designing, testing, and implementing custom software solutions on top of Cisco VoIP platforms. Previously, Peter has also worked on configuring Cisco device firmware and technical marketing for VoIP based services. Peter graduated in 2013 from the New Jersey Institute of Technology with a degree in Software Engineering, with previous education credits from Rensselaer Polytechnic Institute and Stevens Institute of Technology. Felix Delgado explores the labyrinth of provisioning users and devices within Cisco’s UC environment. While coworkers rely on mobile messaging, teleconferencing and single number reach, hiding in the background is the confusing, and time consuming task of configuring these Unified Communication conveniences. Without software tools to help navigate, one wrong click can lead to problems for the end user’s phone, voicemail or presence. Collaboration, an ever-present and fundamental characteristic of every successful business, is often overlooked but is Akkadian Labs’ focus. We offer software solutions for every stage of Cisco Unified Communication adoption and implementation, maximizing your business’ ROI. We bring consistency and security to your Cisco Unified Communications Manager, efficiency to handling incoming calls and usability to your desktop phone. Technology is complex. We make it simple.